The Booth Museum is the creation of the Victorian ornithologist Edward Booth. The museum was built in 1874 to house Booth's collection of stuffed British birds. Each bird is an outstanding example of taxidermy, presented in fascinating recreations of natural habitats. Booth's collection continues to contribute to our knowledge, awareness and admiration of this countries fauna. Though the birds are still the centrepiece in this charming and picturesque building, they now share it with over half a million other specimens from the natural world, together with data spanning over three centuries. Marvel at the beauty and variety of the hundreds of butterflies and beetles from every corner of the world. Wonder at the dozens of skeletons, from a Pygmy Shrew to a Killer Whale. Unearth the Sussex of yesterday with ancient dinosaur bones from 140 million years ago and fabulous fossil fish, over 85 million years old. 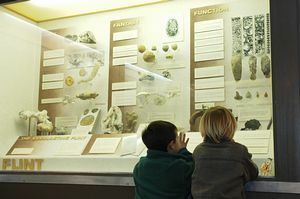 Children will love our 'hands-on' Discovery Gallery, where they can touch a real dinosaur bone, shark teeth and fossil fish! The Booth Museum is host to a wide range of events. Each holiday children's activities are organised. The Museum Shop sells books, postcards souvenirs etc. There are regular temporary exhibitions and an Educational service for visiting schools. There is also a large library and substantial data about Sussex natural history. The Museum operates a loan service (Tuesday & Friday pm only). Please telephone for details. Closed Thursdays and 24-26th Dec, 31st Dec & 1st Jan. Bus service: 14, 14C and 27 from North Street, Brighton.